Hulman & Company and Indianapolis Motor Speedway Chairman of the Board Emeritus Mari Hulman George, who touched the lives of millions through her deep passion for auto racing, stewardship of the Racing Capital of the World and decades of compassionate philanthropy, died Nov. 3 in Indianapolis with her family by her side. She was 83. Mari served as IMS chairman from 1988-2016, but motorsports and the world-renowned racetrack were among the cornerstones of her life since her father, Anton “Tony” Hulman Jr., purchased the facility in November 1945 and saved it from almost certain demolition after World War II. She was a pioneer as co-owner of a team that raced at the highest levels of Midwestern auto racing, in the 1950s and 1960s, a rarity for a woman at the time. She also touched the lives of countless Hoosiers through tireless, generous philanthropic efforts for her entire adult life, with special focus on the arts, health care and, in particular, animal care. Mary Antonia Hulman was born Dec. 26, 1934 in Evansville, Indiana, the daughter of prominent business magnate Anton “Tony” Hulman Jr. and Mary Fendrich Hulman. “Mari” attended primary and secondary school at St. Benedict in Terre Haute and the Ladywood School in Indianapolis, and attended Purdue University. When her father bought IMS in November 1945, Mari was immersed into the world of auto racing, becoming friends with many drivers during her teenage and early-adult years. That loyalty and passion for the sport and its competitors and teams remained steadfast for the rest of her life. Before her 21st birthday, Mari joined with longtime family friend Roger Wolcott to form the HOW racing team, which fielded American Automobile Association (AAA) and United States Auto Club (USAC) Sprint and National Championship cars for several drivers, including Jerry Hoyt, Eddie Sachs, Tony Bettenhausen, Roger McCluskey and Elmer George, whom she married in April 1957. The team was successful. George won the Midwest Sprint Car title in 1957 and finished third in 1956 and 1958. Sachs was runner-up in the rankings in 1954. George ended up 10th in the National Championship standings in 1957, with a victory in a 100-mile race at the New York State Fairgrounds in Syracuse, New York. Mari also fielded an entry in the Indianapolis 500 in 1962 and 1963, with her husband as the driver. Elmer George finished a career-best 17th in 1962, receiving relief help from Paul Russo and A.J. Foyt. Mari savored the friendships she established with drivers, team owners, mechanics and officials during her young adult years, maintaining those bonds for her entire life. She was especially close to legendary four-time Indianapolis 500 winner Foyt, whom she met a year before his 1958 Indianapolis 500 debut and is still a cherished family friend. In a symbol of their enduring friendship, Mari and Foyt placed a commemorative “golden brick” into the famous Yard of Bricks start-finish line in May 2011 to celebrate the 100th anniversary of the inaugural Indianapolis 500 and the 50th anniversary of Foyt’s first “500” victory, in 1961. Mari’s loyalty to her extended racing family was displayed for decades in May through two parties she hosted for drivers. The “Racers Party” took place on the opening weekend of the Month of May leading into the Indianapolis 500, and she celebrated friendships with many drivers from her stint as a team owner during the “Friends of the 50s and 60s” event during the week between qualifying and the race in May. She welcomed all drivers who participated in the “500” – including some who didn’t qualify for the race – to the parties, setting a standard for providing red-carpet treatment to all past and present Indianapolis 500 competitors when they came to the track in May, regardless of their stature with the public. She sometimes even cooked meals for drivers in May during her younger years. Mari also was a constant fixture at the track with her family during racing events at IMS, especially in the Month of May. She visited with drivers and team officials in Gasoline Alley and on pit lane and shared in many magic moments. The photo of her embracing Willy T. Ribbs on pit lane after he became the first African-American to qualify for the Indianapolis 500, in 1991, was especially poignant and cherished by many. Racing fans worldwide also knew her as the individual who gave the famous command to start engines for the Indianapolis 500 and Brickyard 400 for more than 15 years from the late 1990s until 2015. She also became close friends with many of the celebrities who visited the track each May, especially beloved Memorial Day weekend fixtures Jim Nabors and Florence Henderson. The Speedway also served as a platform for some of Mari’s tireless philanthropic efforts. She hosted the “Save Arnold” Barbecue to benefit Indiana Special Olympics every May for nearly 25 years, from 1981 through the mid-2000s. The fun event united drivers, racing personalities and media with Indiana Special OIympic athletes in sports demonstrations and other activities. The “Save Arnold” Barbecue raised more than $1 million for Indiana Special Olympics. Mari also created a program through which thousands of Indiana school children visited the Speedway each May on complimentary field trips to learn about the connections between education and motorsports. Those field trips continue to this day. IMS prospered and evolved into a new era during Mari’s tenure as chairman of the board, from 1988-2016. 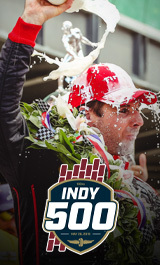 During that span, the Indianapolis 500 grew to unprecedented worldwide popularity. The facility also expanded its annual schedule beyond the Month of May to include the Brickyard 400 for the NASCAR Cup Series, the United States Grand Prix for the FIA Formula One World Championship and the Red Bull Indianapolis GP for the FIM MotoGP World Championship. That evolution required significant capital improvements to the facility, such as the construction of the new Pagoda control tower, an infield road course that included parts of the famous 2.5-mile oval, new pit-side garages and various safety improvements. IMS and INDYCAR also led the development of one of the greatest safety innovations in motorsports history – the energy-absorbing SAFER Barrier – during Mari’s tenure as chairman. That barrier system was first installed in 2002 at IMS and soon adopted at nearly every major oval track in North America and many road courses worldwide. These contributions to IMS and motorsports – along with her charitable work for the racing community – led to Mari being inducted into the IMS Auto Racing Hall of Fame in 2015. Mari’s commitment to racing was equaled by her generosity for supporting local, regional and national causes. She was devoted to the arts and education and served for years as a trustee at the Rose-Hulman Institute for Technology in Terre Haute, which was founded in 1874 with significant assistance from the Hulman family. She received an honorary doctorate degree from Rose-Hulman in 1998 and from Saint Mary-of-the-Woods College, also located in Terre Haute. The Hulman-George family also made large contributions to the Indianapolis Museum of Art, Indiana State University, Purdue University, Indiana University and Saint Mary-of-the-Woods College, among other art and educational institutions. Mari also was a leading charitable force to benefit animal care, especially for horses and greyhounds, two of her greatest passions. Her dedication to learning and horses led to the endowment and establishment in 1989 of the equine science program at Saint Mary-of-the-Woods, named the Mari Hulman George School of Equine Studies. The school also conducts the Mari Hulman George Thoroughbred Adoption to provide proper care for horses. She also raised, bred and rode horses at the family’s farm, Circle S Ranch near Terre Haute, the family ranch in Wyoming and at stables in Florida. Her quarterhorses and thoroughbreds competed in numerous events. The Mari Hulman George Stakes remain a prestigious annual stakes race at Indiana Downs, in tribute to her dedication to horses and racing. She worked tirelessly to promote adoption of retired racing greyhounds, leading by example by taking in many of the dogs at her farm. She also housed stray dogs at an extensive kennel at the family’s farm. Besides serving as chairman of the board for Hulman & Company, IMS and the IMS Foundation, Mari also was a longtime board member of First Financial Bank, a publicly traded company headquartered in Terre Haute. Mari is survived by three daughters, Nancy George, Josie George and Kathi George-Conforti; a son, Anton H. “Tony” George; a stepdaughter, Carolyn Coffey; seven grandchildren, nine great-grandchildren and her longtime companion, Guy Trollinger. She was predeceased by her husband, Elmer, and a stepson, Joseph George. A Mass of Christian Burial will take place at 12:05 p.m. (ET) Thursday, Nov. 8 at St. Benedict Catholic Church, 111 S. 9th St., Terre Haute, Indiana. Father Martin Day (OFM Conv) and Father Mike Welch will officiate. Private burial will occur at Calvary Cemetery in Terre Haute. While Mari Hulman George loved flowers, it was her wish for friends to make memorial contributions to any of her charitable interests, the Alzheimer's Association ( www.alz.org) or to the charity of their choice. Visit www.callahanandhughes.com for memorial tributes and additional funeral information.